Leopard Felix trying to help us tagging the necessary educational info on his species to the enclosure. Wild animals should not be kept in cages. The optimal environment other than releasing them into the wild is to provide enclosed area’s where they are safe and stress-free, can exhibit natural behavior and have access to enrichment options. 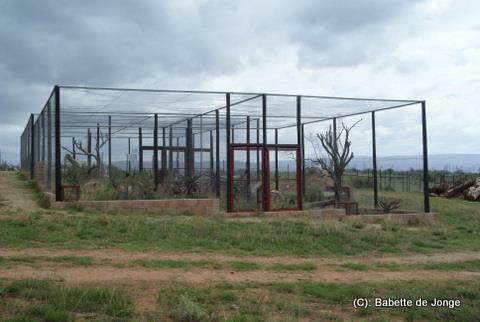 Enclosures are large caged areas (> 1000 square meters) also closed at the top. By moving animals occasionally from one enclosure to another we can provide varying and interesting experiences and also different companions. 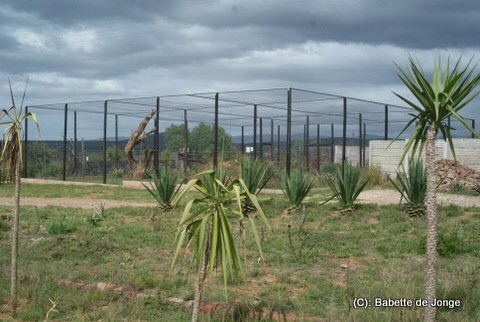 Camps are fenced of area’s of land, multiple hectares, where animals can be roam about freely and be prepared for release into the wild. 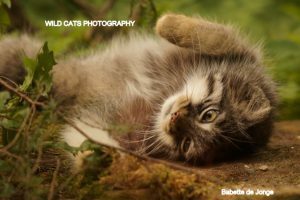 Wild Cats World is always looking for projects to invest in and to cooperate with, focusing on the welfare of the endangered wild cats. 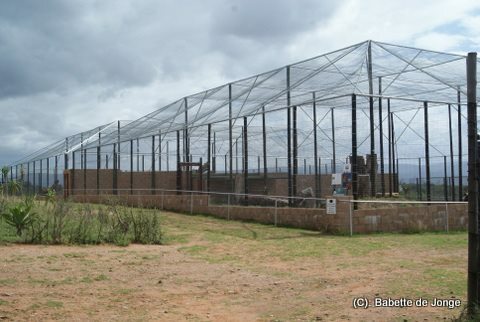 Our partner Daniell Cheetah (together in: Spotted Cats Conservation Project) owns an incredible huge piece of land in the Addo Area/SA and gives Wild Cats World the opportunity designto do our projects and enclosures/camps alongside his great cheetahproject. We only want space and welfare for the cats. Only happy cats at our projects, who are offered a way to live naturally and lots of enrichment. 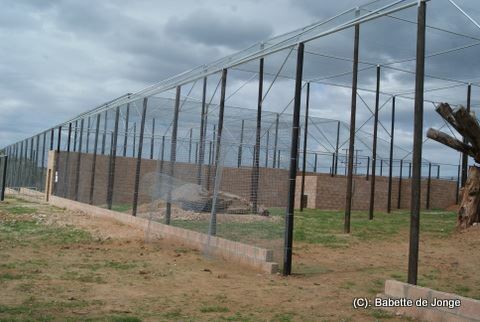 Black-footed cat and Serval Projects/enclosures. Observations at night show that the cats really thrive well and show natural behaviour. Esp. blackfooted cats are very nocturnal cats. Nothing but the best for the leopards. 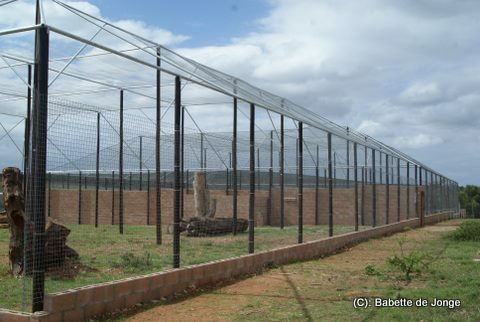 To start with we offer the three resident ambassador leopards two huge enclosures of each 900m2 with a passage on the roof of the nighthouses connection to the other enclosure of 900 m2, so for now 1800 m2 natural space for 3 leopards.Highest point is 8,5 metre, since leopards are great climbers. When there’s two couples they will be regularly given the opportunity to go from one enclosure to the other for enrichment. The eventual re-wilding camps (for future offspring) will be much bigger of course. Also for the caracals lots of space and also high enclosures with lots of natural enrichment. 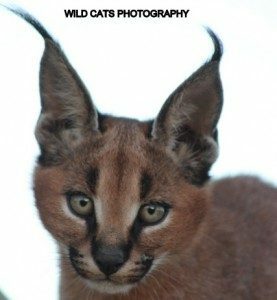 330 m2 or more for 2 caracals. 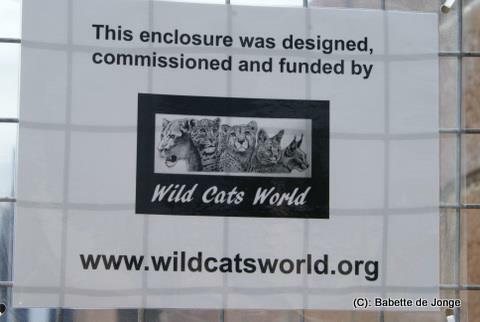 All enclosures of leopards, black footed cats, caracals and servals, African wildcats as well as the huge camps for cheetahs are designed, commissioned and funded by Wild Cats World. They are constructed by Francois Erasmus, who does a great job and knows with one word what our wishes are. 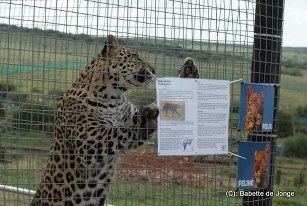 The Spotted Cats Conservation Project, S.A. is the only captive project of Wild Cats World that allows visitors. It is based in South Africa/Eastern Cape on the Daniell (Cheetah) farm. 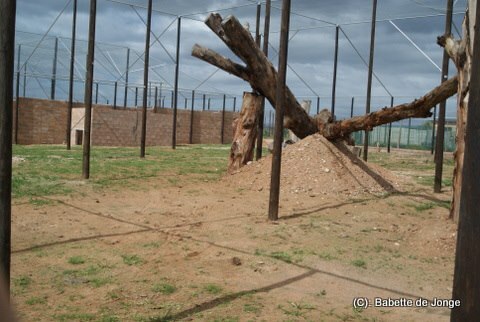 The two enclosures of the leopards are connected (1800 m2 for at the moment 3, at a later stage 4, leopards. Inside the enclosures are completely different so it will give them more enrichment. 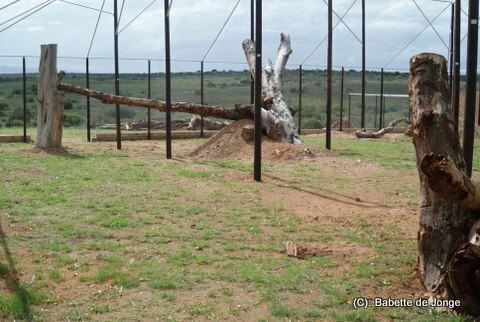 Great space, hight, natural enrichment….all essential to keep the leopards as happy as can be!!! And with us they are!!! It is so nice to design a natural place for the cats, greatly supported by constructor Francois Erasmus who knows exactly what we mean by just one word! A huge adventure for the leopards to explore the new enclosure…..to realise they actually can walk from the one enclosure to the other.